Add the stylish Swurfer surfboard swing to your backyard this summer and get ready to ride the waves. This innovative design is an exciting twist on a tree swing that will appeal to kids as well as adults. The standing swing is shaped like a skateboard unlike the standard flat piece of wood used for typical swings. The curved shape of the swing allows for more swinging-power and a large range of motion. This unique design allows riders to surf the air in all directions. How is the Swurfer Swing Made? Each Swurfer swing is individually made by hand from maple wood. Every board is inspected by hand before leaving the shop and is guaranteed with a warranty against manufacturing defects. These boards are high-quality and are made to last. The Swurfer does have a smooth finish which may be a little slippery at times. Install SwurfGrip Traction Pads onto your board to get more traction. The board measures 33 inches long and 10 inches wide and can support up to 250 pounds. The swing can be used by anyone aged six and older. 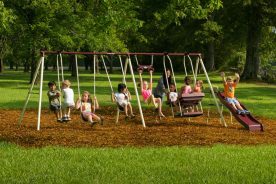 Each swing comes with an 80 foot, double-braided rope that is mildew and UV resistant. Who is the Swurfer Swing Best for? The Swurfer Swing is great for adults and kids. 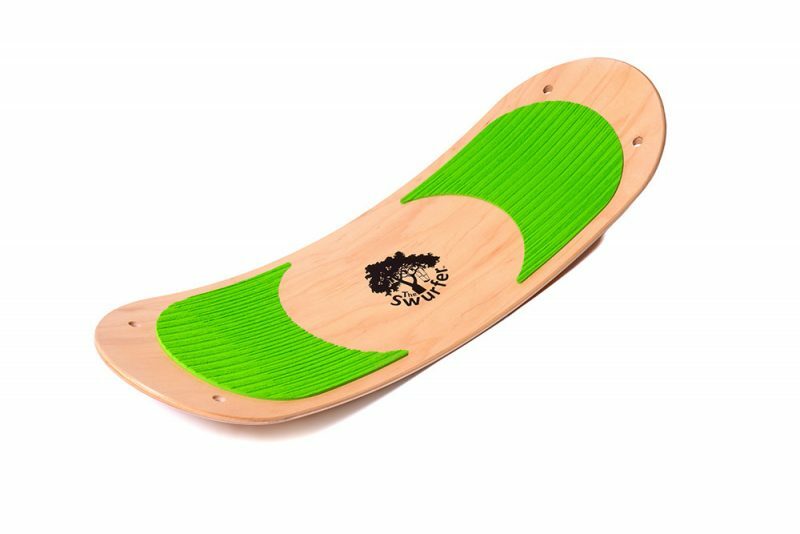 The curved shape of the board allows you to swing through the as if surfing, snowboarding, or skateboarding. You can sit and use it like a traditional swing or stand up and move in all directions. This board is great for improving core balance, and strengthening arms and legs. If you like board sports such as surfing, snowboarding, or wake boarding this is a great swing to work on board skills. 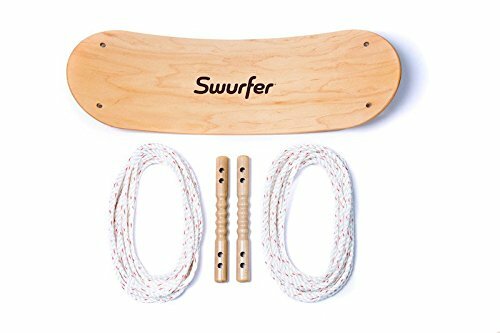 Is the Swurfer Swing Easy to Install? The process to hang your swing is very easy and should only take about 20 minutes. The first thing you want to do is identify the tree branch you are going to hang your swing from. The branch you pick should be at least eight feet tall with the swing location being eight feet away from the trunk of the tree. For best results the branch should be between 12 and 20 feet high. Make sure your branch is sturdy and not decaying. Inspect your chosen branch to make sure there are no cracks, cavities, or mushrooms growing from it to ensure it is a safe branch. 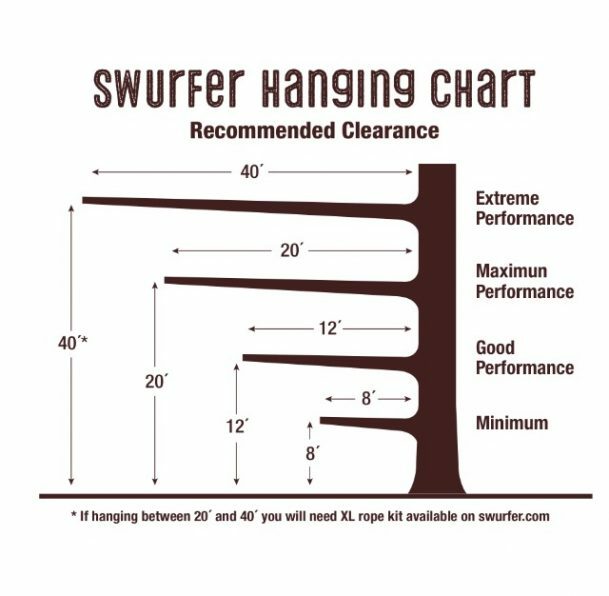 Your Swurfer Swing comes with 80 feet of rope. You will need half of the length of rope for one side of the swing and the other halve for the other side. Find the center of one 40 foot rope. Wrap the center of the rope around the branch so there is a loop. Pull the ends of the rope through the loop. The center of the rope is now secured to the branch and the ends are hanging down. Repeat with the second 40 feet of rope. The ropes should be spaced 24-36 inches apart. If you do not have a ladder you can easily wrap the rope around a branch using a bean-bag and twine. Tie the twine to the bean-bag and toss the bag over the branch. Secure the twine to the center of the rope and pull the rope over by pulling the twine. After the two ropes are in place it is time to add the handles. The placement of the handles depends on how tall the rider will be. If the swing will be for adults and kids you may want to consider adding an extra set of handles. One set can be closer to the swing for the kids and the other set will be higher up for the adults. Extra handles can be purchased separately. Loop the handles in place then thread the rope through the base (swing). Tie the ropes under the base using a double overhand knot. You can level your swing by adjusting these four knots. After your swing is leve, trim you rope and melt the ends to prevent fraying. 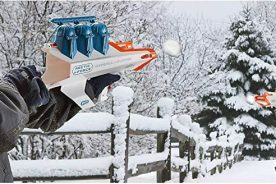 Where Should I Install my Swurfer Swing? The recommended place to hang your Swurfer Swing is from a sturdy tree branch. If you don’t have a tree around or don’t have a sturdy branch you can also use a swing set or perhaps your deck. Hang it as you would a glider so the Swurfer Swing is swinging parallel to the legs of the swing set. If you don’t have a swing set hang the swing from your porch or under your deck using eye bolts. Just be sure to give yourself room and there are no obstacles in your path. How Should I Care for my Surfer Swing? 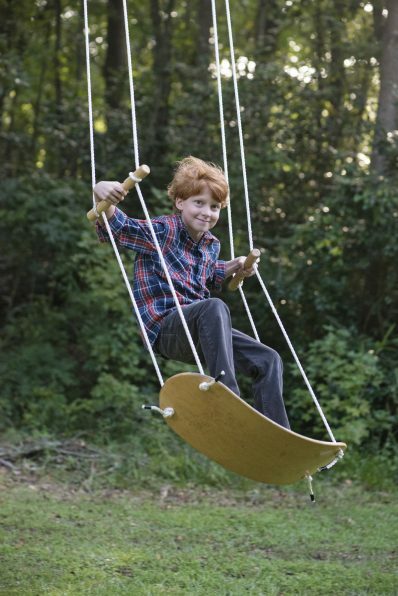 The Swurfer Swings are all created with high-quality wood and superior Italian finish. 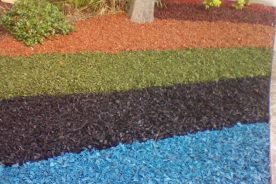 The finish is designed to withstand the elements and wear and tear that comes with active play as well as keep it looking great. Because of this there is not much you need to do to maintain your Swurfer Swing. Your swing may weather and turn gray, depending on where you live and your weather conditions. If you enjoy this look leave it as is and seal it with polyurethane. If you want to restore your swing to look like the day you got it you’ll need to start by washing it with soap and water to remove as much dirt as you can. After you clean it sand it lightly and remove any dust you may create. 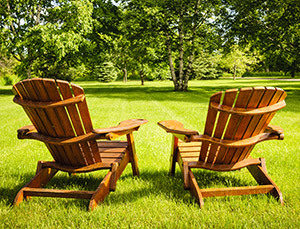 Clean it the wood with either bleach-and-water, deck cleaner, or wood brightener. Leave the cleaner on for 10 minutes then wash off. Finally seal the wood with water-based polyurethane. You will probably need more than one coat.